Nyamuragira volcano (3058m) is a large basaltic shield volcano located about 15 km north of the city of Goma in the Democratic Republic of Congo. 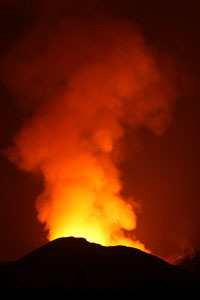 Nyamuragira (or Nyamulagira) is frequently active, either within the summit caldera, or more problematically from varying locations on the flanks. 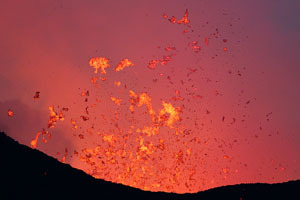 The flank eruptions are frequently accompanied by persistent lava fountaining, resulting in rapid enplacement of parasitic cones (of which more than 100 can be found), and lava flows which may extend for many kilometers due to the high fluidity of the potassium-rich low-silicate lava. The volcano has a steep-sided summit caldera with an approximate diameter of 2km, within which the main summit crater hosted a lava lake from 1921-1938. The slopes of Nyamuragira rise gradually, in contrast to the adjacent steep-sided Nyiragongo volcano to its SE, thus extending far from the summit region. 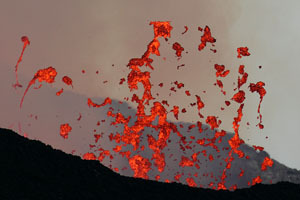 This, is a further factor accounting for the unusual length of some of the lava flows emplaced by the volcano. The flow field of Nyamuragira covers an area of 1100 square km. Flows from 1938-2010 have been mapped by Smets et al. 2010 (J. Afr. Earth Sci. 58, p.778-786; see Fig.2) cover over 40% of the flow field. The paper also provides estimates of eruptive volumes for each eruption during the period, with average erupted volumes estimated at 72 million cubic meters, and a maximum of 200 million from the 1938-1940 eruption. Fig.1 Annotated Satellite Image of Nyamuragira and its Surroundings. Solid white lines: Bay of Bufumbira, Dashed white lines: Kamatembe Rift. Inset Shows East African Rift System in the Area Surrounding Nyiragongo. With kind permission of T. Platz. Fig.2 Map of lava flows from Nyamuragira volcano from 1938-2010 (darker flows are most recent). From Smets et al. 2010, J. Afr. Earth Sci. 58, p.778-786. 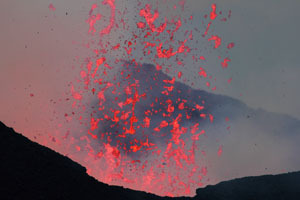 The Nyiragongo lava field is also identified with its flows from the 1977 and 2002 eruptions. With kind permission of B. Smets. 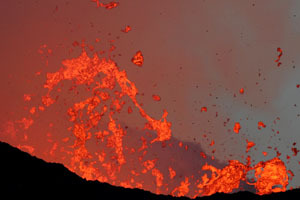 Nyamuragira volcano lies in the Virunga volcanic field which includes 8 volcanic edifices broadly trending in an E-W direction to the north of Lake Kivu. 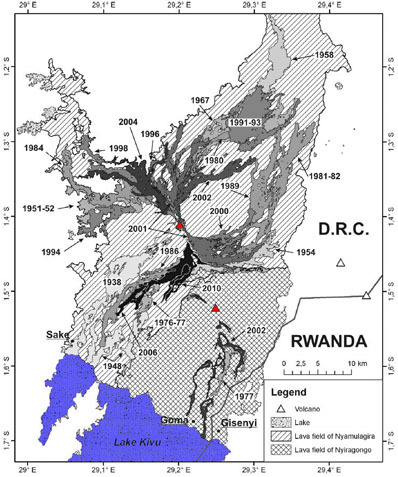 The Virunga field belongs to the western branch of the East African Rift System and is located at the intersection between the N-S trending Albert Rift and Kamatembe and Bay of Bufumbira Rifts (see Fig.1). The wider geodynamical setting is discussed in more detail by Ebinger and Furman (Acta Vulcanol. 14/15 (1-2), p. 9-16 (2002)). 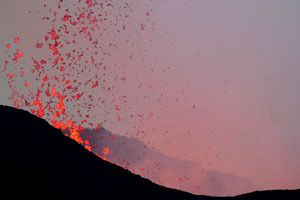 Nyamuragira and nearby Nyiragongo mark the western end of the Virunga volcanic field and together with Visoke are the only volcanoes which have been historically active in the area. Virunga volcanoes erupt extremely fluid low-silica high-alkaline lavas. 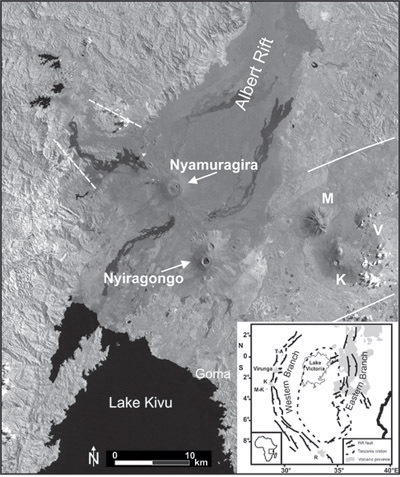 Several fault systems meet at Nyiragongo, (1) the main N-S fault, (2) a NW-SE trending system linking Nyamuragira to Nyiragongo, (3) a NE-SW trending fault system including the Rushayo chain of scoria cones (formed in 1948), and possibly (4) a further fault approximately parallel but west of the Rushayo chain over which lie the scoria cones of Muhuboli and Gituro (see Fig.2). These appear to have been active in recent times. Since 1865, when historical records for Nyamuragira began, further eruptions have been reported in 1882, 1896, 1899, 1901, 1902, 1904, 1905, 1906, 1907(2), 1908, 1909, 1913, 1920, 1921, 1938, 1948, 1951(2), 1954, 1956, 1957, 1958, 1967, 1971,1976, 1980,1981, 1984, 1986, 1987-88, 1989, 1991, 1994, 1996, 1998, 2000, 2001, 2002, 2004, 2006, 2010 and 2011-2012 (GVP Eruptive History Data). 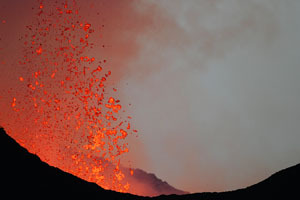 The 2011/2012 eruption, which began on 06.11.2011 is limited to a fissure system running in an approx. west-east orientation (perpendicular to the Albertine Rift) about 10km east of the summit caldera. Lavas have partially flown over areas covered during the 1989 eruption. They have largely flowed northwards, extending to distances of just over 10km from the fissure within 6 days during the period of maximum efflux. 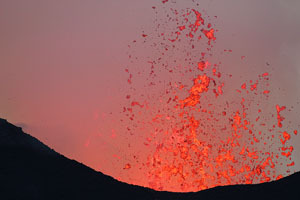 Two crater complexes, each with multiple vents, have been created over the eruptive fissure which has a length of at least 1km. The areas surrounding the vents are buried in a layer of smallish and fragile lapilli. 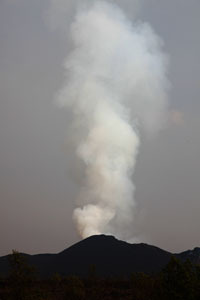 After cessation of activity at the vents of the primary (western) crater complex, activity continued along the same fissure but slightly further from the summit of Nyamuragira creating a secondary (eastern) crater complex which was observed from 23-25 Jan. 2012. The exact dates at which individual vents were active are not recorded since continuous observations were not made. Wide-angle view of active secondary crater complex and proximal flow field. 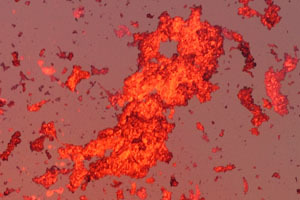 Lava is mainly in tunnels but flows are visible to far left with a temporary breakout visible nearer the center of the image. 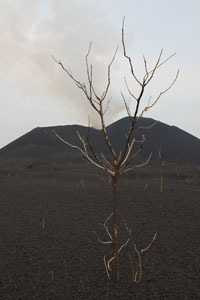 View is from primary crater complex of same eruption (2011/2012). Distant lava flows. 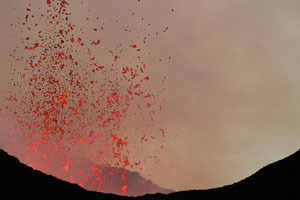 Extensive flow fields are common features of eruptions at Nyamuragira. 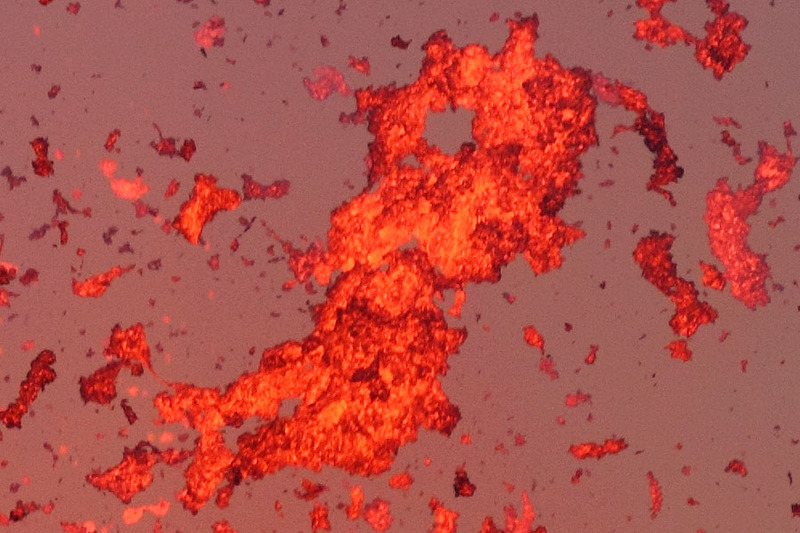 View of same flow as left image showing that flow path has changed from one day to the next, forming islandin middle of lava. Gas cloud rising from active crater. Nyamuragira is one of the primary producers of sulphur dioxide worldwide. Trajectories of volcanic bombs at night. Very difficult to photograph due to permanent intense glow from crater. Small cluster of bombs during "blue hour"
Smallshower of bombs during "blue hour"
As on left image. Forest behind is normal vegetation flanking flow field. 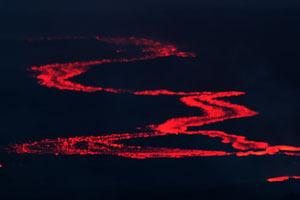 The lava field created by Nyamuragira is extensive and largely constrained by local topography such as Nyiragongo volcano, which limits extention in the direction of the town of Goma. 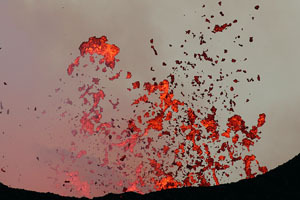 Between 1938 and 2010, more than 40% (430 square km) of the flow field have been freshly covered in lava (Smets et al. 2010, J. African Earth Sci. 58(5), p.787-798). 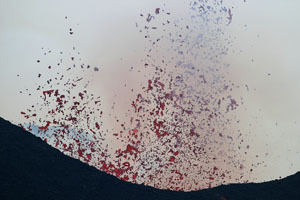 Most flows have emanated from a fissure zone running NE-SW through the summit crater. The field extends largely in a SW-NE orientation, significantly to the coast of Lake Kivu about 20km away, which has been reached by flows 3 times since historical records began, most recently in 1938 and 1948. Significant entry of lava into the lake is considered hazardous since it could trigger release of gases trapped in the depths of the lake (see discussion in Nyiragongo section). 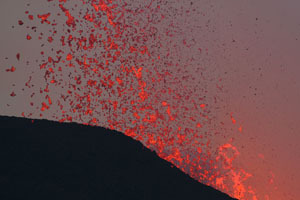 Due to the generally effusive nature of activity at Nyamuragira and lack of significant settlements on its flanks, eruptions have rarely been associated with fatalities. 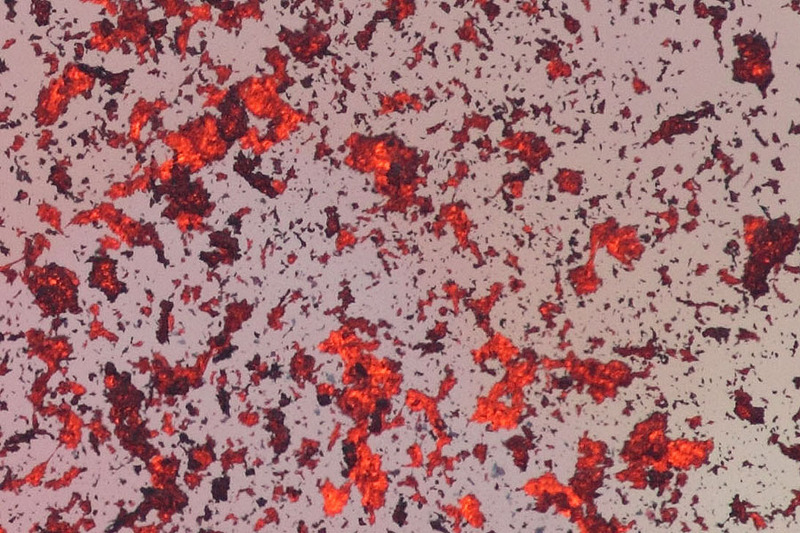 Nyamuragira is however possibly the most prolific volcanic producer of sulphur dioxide worldwide with in particular tremendous amounts of the gas driving persistent lava fountaining episodes (Bluth and Carn, 2008, Intl. J. 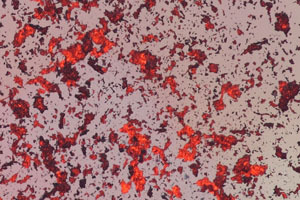 Remote Sensing 29(22), p.6667-6685). 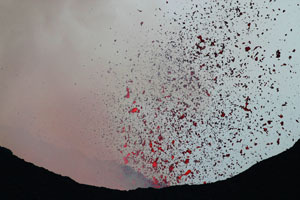 Between 1979 and 2008, 25 Million Tonnes of sulphur dioxide were released during a total of 14 eruptive episodes. 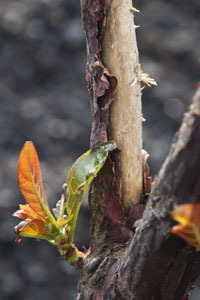 The gases and associated acidic rain may have a significant impact on crops in the area and also cause rapid corrosion to human infrastructure (e.g. corrugated iron roofing). 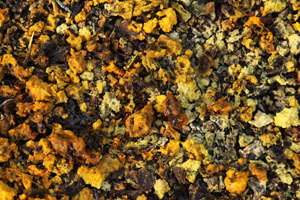 Further, the large amounts of small lapilli and Pelee's hair produced during the prolonged fountaining episodes also impact on pastural land around the volcano, causing problems when injested by cattle. 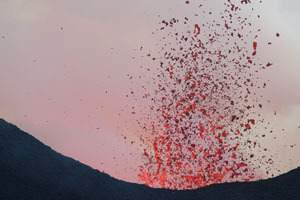 Respiratory problems in human populations situated downwind have also been reported following eruptions. 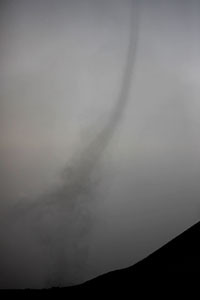 Fortunately, the predominant wind directions carry the gases largely to the west, rather to the more densely populated areas to the south along the shores of Lake Kivu. 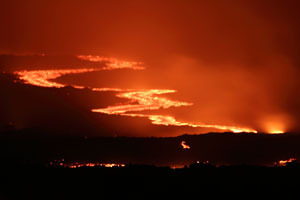 The town of Sake is the only significant population center within the flow field and remains vulnerable to lava flows. 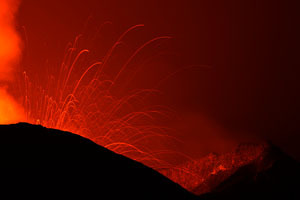 Due to its distance from the eruptive centers, sufficient time should remain for its evacuation, if necessary. The region surrounding Nyamuragira remains politically volatile with some areas to the north remaining under control of rebel / criminal groups. Reliable up-to-date information should be obtained before travelling. Most visitors reach Goma via the Goma / Gisenyi border crossing after flying to Kigali in Rwanda. 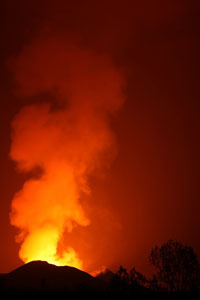 Whilst Nyamuragira is rarely visited, nearby Nyiragongo continually draws small numbers of tourists and guides and porters can be arranged for the approximately 1600 meter ascent from the National Park Headquarters. Nyamuragira shield volcano has been problematic to visit in the past, however due to the location of the eruptive vents in the Nov. 2011-Feb. 2012 eruption, sporadic visits (including my groups visit) were undertaken with the support of armed rangers. 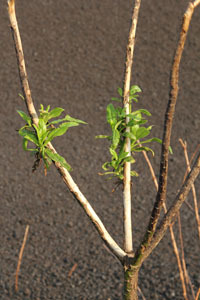 Everything was well organized and ran smoothly (Situation Jan. 2012). In Goma, photography may be hindered by corrupt police claiming that a permit is necessary and demanding that one pay a fine (without receipt of course). However, obtaining a permit is essentially impossible since there is no obviously responsible authority. Goma does have modern Supermarkets (serving largely the UN troops) and a couple of modern hotels located by the lakeside, yet much of the town remains in a desolate state. Visitors may visit the Gorillas in Virunga National Park. Permits (as for Nyiragongo) must be arranged in town. The roads leading to the Rumangabo Ranger station where Gorilla trecks start necessitate the use of a 4WD vehicle. The park authorities are very helpful and due to the recently improved security situation, further parts of the park are gradually opening. This means that in principle 2 volcanoes are accessible, and in addition tracking to both Gorilla and Chimpanzee groups is possible. Money from visitors is used for developing and protecting the park.